The Series 3MSV Compact 3-Way Ball Valves are the perfect choice for directional control of fluid in instrumentation and process systems. The micro finished ball and PTFE seats ensure quality seal and easy operation. The straight through flow path design allows for minimal pressure drop. 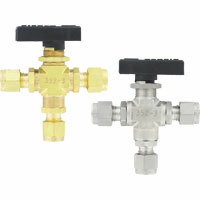 The valve body comes in either brass or 316 stainless steel, offering a variety of options. Blow-out-proof ball and stem provides extra durability and safety in the event of over pressure. Body, Connector: 316 SS or brass; Stem, Ball: 316 SS; Stem O-ring, Connector O-ring, Back-up Rings: Fluoroelastomer; Ball Seats: PTFE. -40 to 350°F (-40 to 176°C). Female NPT, fractional tube fitting.